A number of years ago, we embarked upon a journey which would significantly enhance the community of St-Norbert as the southern gateway into the City of Winnipeg. Pembina Highway runs through this historic community but the state of this “highway” which also serves as its main street was a detriment to both residents and the development of its business community. With the financial assistance of Manitoba’s Infrastructure Secretariat a number of years ago, a first physical investment was made on the median of the business strip. This first step allowed us to convince the private sector to look at this community as a place to invest and we did so with undeniable success. It also allowed us to convince the business community of the benefits of better collaboration and in this spirit and working with Group’Action Saint-Norbert, together we managed to set up the Zone d’amélioration commerciale Saint-Norbert Business Improvement Zone (BIZ). The BIZ is now a treasured partner for us as we collaborate on a number of projects for the betterment of the business community. 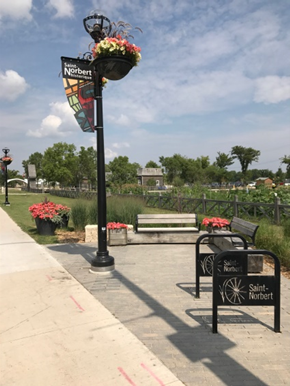 In 2016, along with the BIZ we undertook a $125,000 investment which adds decorative street lamps, aluminum banners and hanging flower pots at strategic locations along the boulevard, many of which are in front of the nationally renowned St-Norbert Farmers’ Market. Working with consultants, we managed to maintain a visual theme and now other community groups are carrying the brand through their work. For example the St-Norbert Farmers’ Market within their new infrastructure investments, St. Norbert Heritage and the St-Norbert Foundation have printed t-shirts with the brand as a fundraiser, as well as the St-Norbert Community Centre who has recently added the graphics to a new pillar sign. Over the 2017-18 season, we have initiated a second phase of decorative street lamps for the west side of the street with hopes of getting in the ground in the fall of 2018.